Mitchell Park (f. by Artie Schiller). 2 wins at 1200m, 1300m in 2018 in Philippines. Texacody (g. by Duporth). Winner at 1600m in 2017-18 in Aust. HOUR OF PERIL (Fusaichi Pegasus). 6 wins from 1200m to 1600m, A$265,010, Qld Tatt's RC Tattersall's Mile, L, BRC Mick Hall Rock Vegas 3YO H., Kate D Art & Colour H., Montrose Access P., 2d BRC Rough Habit P., Gr.3, Mirvac Hotels & Resorts 2YO H., GJI Data Intelligence H., Nestea Iced Tea H., HLB Mann Judd H., 3d BRC Australian Financial Advisers Quality H., Racing Retro H., 4th BRC Members' H., L.
Geodude - Monica (H.K.). 2 wins at 1400m, 1500m in 2016-17 in Aust. Oakfield Monarch. 2 wins at 1400m, 1700m in 2016-17 in Aust. Eff One. 4 wins at 1100m, 1200m in Aust. The Revenant. 2 wins at 1000m, 1300m in 2017-18 in Aust. MIGHTY SUPREMO (Mark Anthony). 10 wins-1 at 2-to 1400m, A$115,705, VRC Moomba P., Gr.3, Macdougal H., Yarraville Welter H., MVRC The Tetrarch H., Glenara H., QTC Denise's Joy Welter H., 2d SAJC Goodwood H., Gr.1, VATC Victoria H., Gr.3, Schweppes Cup, Gr.3. AVATAR (Showdown). 9 wins from 1100m to 1600m, A$207,700, VRC Tattersall's P.H., L, 2d VRC Pure-Pak S., Gr.1, VATC Futurity S., Gr.1, Toorak H., Gr.1, 3d VRC Blamey S., Gr.2, MVRC AJ Moir S., Gr.2, Alister Clark S., Gr.2. Sire. Cossack Ruler (Cossack Prince). 11 wins from 1200m to 2000m, A$170,555, Bendigo JC Diabetes Australia Cup, 2d Darwin Cup, L, VATC Kilsyth H., 3d VATC Schweppes Cup, Gr.3, VRC Country Cup, 4th VATC Royal Show H., L.
Lord Salamanda. 8 wins from 1200m to 1800m, BATC Manildra Group H., Carrington Extra H., 2d BATC Maybe Lad H., QTC Bennett H.
Bull McCabe. 4 wins to 1450m, VRC Melbourne Foundation Day H.
Mighty Sheik. 4 wins to 1350m, SAJC Fielding H.
Centetto (Century). 3 wins at 1200m, 1400m, WATC Burswood Resort Hotel Winter Series H., 2d WATC EM Fruit'N Veg H., Mulder H., 3d WATC Aquanita S., L.
High Pitched. 9 wins-3 at 2-from 1000m to 1600m, AJC Maurice O'Shea H., Dubbo H. Producer. CHONG TONG (Encosta de Lago). 6 wins-2 at 2-to 1400m, A$508,830, VRC L'Oreal Paris P., Gr.3, Bobbie Lewis H., Gr.3, MRC Sandown S., Gr.3, VRC Sutcliffe S., L, Flying Spur 2YO H., BTC Merry Christmas 2YO H., 3d VRC Lightning S., Gr.1. Genius (Onemorenomore). 2 wins at 1100m, 1200m, Singapore TC Inglis Melbourne Juvenile S., Open 2YO H., 2d Singapore TC Aushorse Golden Horseshoe, L.
Bionics (Hinchinbrook). 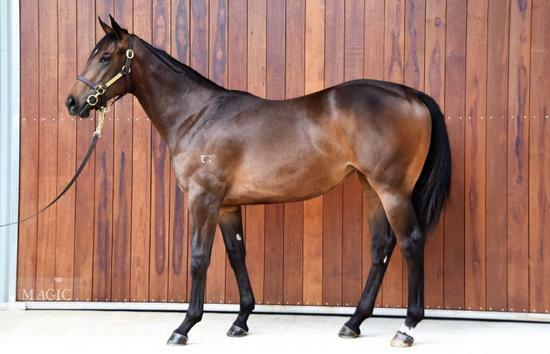 Placed at 2 & 3 to 2018-19, 2d MVRC Inglis Banner 2YO S., L, 4th VRC Maribyrnong P., Gr.3. Race Record: 2 Starts 0-0-0 A$1,175.